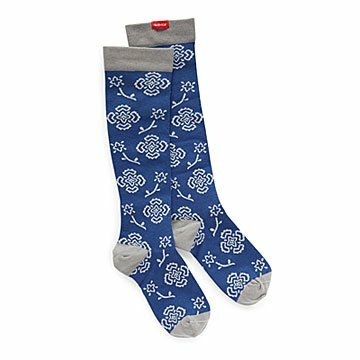 These blooming brilliant compression socks stand up to the daily grind and stand out in a crowd. Stand up to the daily grind and stand out in a crowd with these blooming brilliant compression socks. Developed in partnership with vascular surgeons and vein clinics, they're scientifically designed to support your legs all day, every day, no matter your lifestyle. The integrally knit fabric applies therapeutic pressure that increases the circulation of freshly oxygenated blood back to tired legs. The body-hugging material can energize legs, reduce swelling, and aid muscle recovery following intense exercise. Designed to help you power through cardio day, this moisture-wicking pair draws sweat off the skin, keeping you dry and supported as you bust out those last burpees. Socks feature 400-needle count cotton with mild-moderate compression (15–20 mmHg). Made in Taiwan. Machine wash after each wear, cold water, delicate. Air dry. They help support my legs & feet when I have to be on my feet for extended amount of time, or walking a great deal like at the Zoo!